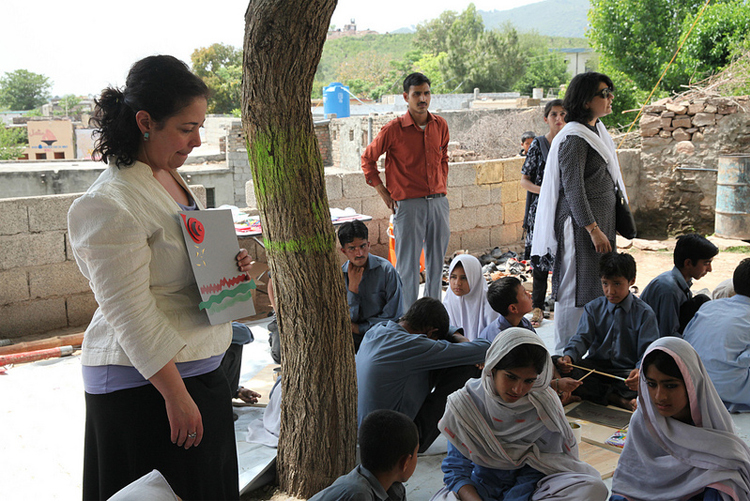 Read Rachel’s last post in her series on teaching art workshops in Pakistan here. You can follow her on Twitter @EducatorRachel and also on Instagram. Today was my last day in Pakistan and what an adventure it’s been! I’ve worked with artists, students, curators, teachers, and museum/gallery professionals from all walks of life and from every corner of Pakistan. Today’s workshop was with art teachers from Islamabad and the surrounding areas. We used the Phillips’s Jacob Lawrence and The Migration Series Teaching Kit to explore different ways to teach art at their school. This group of educators was enthusiastic and eager. Together they brainstormed wonderful lesson ideas. Some teachers talked about using The Migration Series to inspire their students to write poetry, others proposed using it as a way to introduce the idea of beginning/middle/end in storytelling, and there was much discussion about comparing and contrasting Lawrence’s migration story to the stories of those Pakistanis who migrated during partition. I have had an incredibly rich, warm, and world-view expanding experience here in Pakistan over the last couple of weeks, and I am incredibly grateful to have been sent on this journey! Stay tuned for an article with more details about my adventure in the Phillips’s fall members magazine. In the meantime, I’m signing off from Islamabad. Art teachers use the kit to brainstorm ideas for using the migration series in their classroom. Photos: Rachel Goldberg. Teachers consider the universal themes in Lawrence’s work and discuss ways to integrate the arts into their lessons. 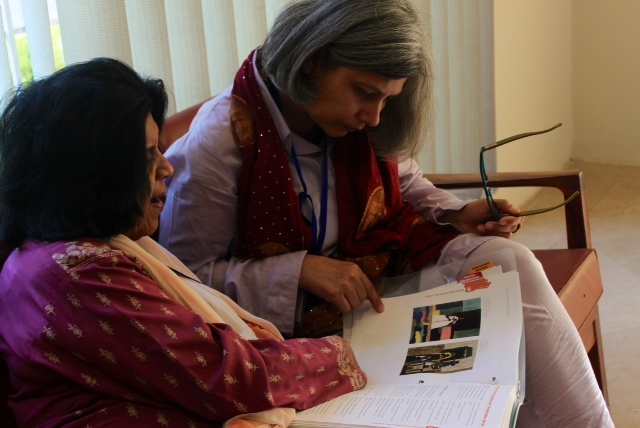 Ajani Husbands, an Assistant Cultural Attaché at the U.S. Embassy in Islamabad, Pakistan, is working with the Phillips’s Rachel Goldberg as she facilitates workshops. 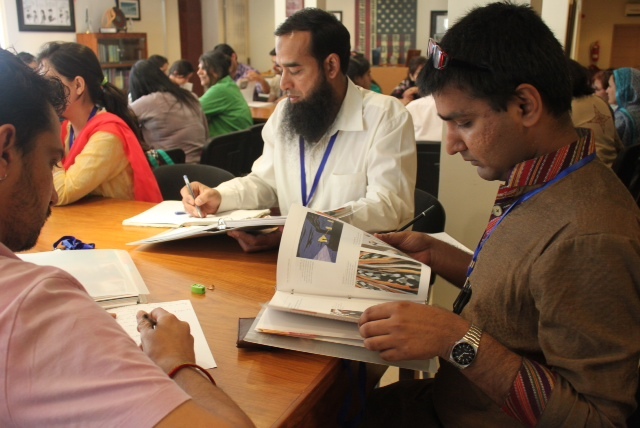 Read Rachel’s last post in her series on teaching art workshops in Pakistan here. You can follow her on Twitter @EducatorRachel and also on Instagram. Students at Mashal Model School in Islamabad, Pakistan. One may never see such enthusiasm, such vigor for life as is visible in the work of the students from the Mashal Model School in Islamabad, Pakistan. The students at the school are mostly refugees from Afghanistan, internally displaced persons (IDPs) from throughout Pakistan, or simply street children, who have run away from abuse or poverty at home. When children come from such conditions, one expects them to be angry and bitter towards the world. Yet the children of the Mashal Model School exude love and an eagerness to learn. 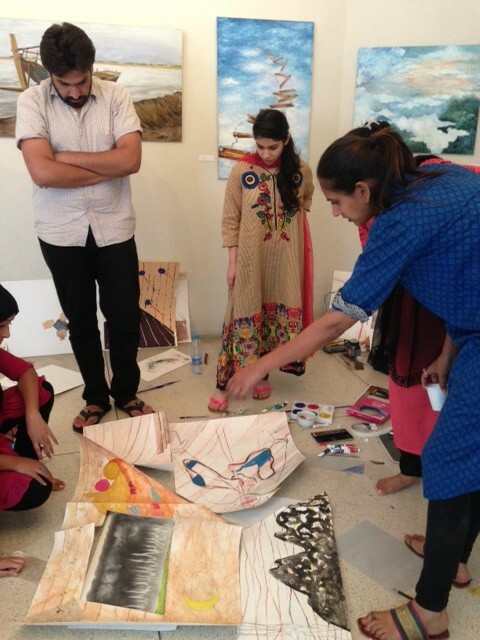 Students create art in response to Jacob Lawrence’s Migration Series in Islamabad, Pakistan. The Phillips’s Rachel Goldberg in action, conducting a workshop in Islamabad. For many of these children, The Migration Series is an easy concept to grasp, having emigrated from Afghanistan or the farthest reaches of Pakistan to end up in Islamabad. Their artwork reflected such journeys, with stories as vivid as the ones depicted in Jacob Lawrence’s work. One student made a collage of his vision for his old school in Afghanistan, a brand new building with several stories and the sun shining overhead. Another created a tree, surrounded by a border with a red snake climbing up the trunk. “His family is trapped inside the tree,” the school’s director explained, “and the snake represents the religious extremists ready to strike against his family should they leave.” The students’ stories spoke volumes, telling lifetimes of experiences on single sheets of paper. Zeba Husain, founder and director of Mashal Model School, spoke a little bit about the school and the workshop in an impromptu interview. The interview was cut short since a student had to leave early. “He says that he’s done drawing and has to go to work,” she explains. The student, perhaps 12 years old (he himself was unsure of his age) had drawn a colorful train, but was running late for his job selling samosas. Still, he had drawn the train with such purpose that one wondered if he minded being late at all, or would have stayed to draw some more if circumstances permitted. Picasso and Raphael never experienced the lives lived by the children at Mashal Model School. Perhaps this is why it has taken them lifetimes to learn how to paint with the fervor of these children. You can find out more about Mashal Model School on its website and Facebook page. I can’t believe it has already been over a week since I landed in Lahore. Four workshops, about 200 artists, curators, and teachers, and a whole new appreciation of Jacob Lawrence, The Migration Series, and the power of collaboration and storytelling through art. Just like Lawrence and other artists working during the Harlem Renaissance, participants here have worked together to tell their stories–some are stories of identity and personal struggle, others are stories about Pakistani history, from ancient to contemporary. 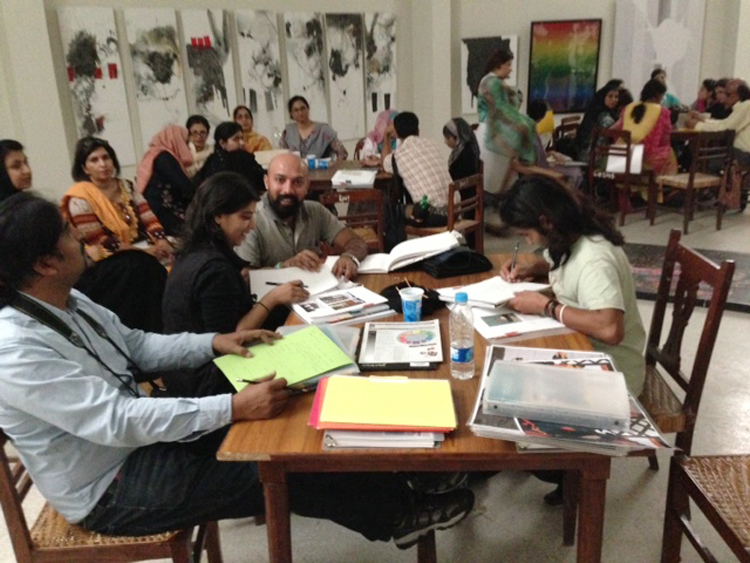 Emerging artists in Lahore hard at work collaborating. Teenagers will be teenagers. They’ll pout about being separated from their friends, they’ll hesitate and struggle with a new group of peers, and then they’ll find their confidence and make amazing things happen. Artists will be artists. They’ll walk around barefoot, pour tea on their paper and then paint with it, take too many smoke breaks, and keep a serious face during the goofy group pictures. They’ll also collaborate to create strong, powerful narratives that help us to understand their point of view, often on a profound level. The details of personal stories here in Pakistan may be different than those I’ve encountered in my work in the United States, but many of their themes are universal–life can be very hard, understanding history is important, and sometimes we have to sacrifice and make great change in the hope of creating a better life. I’m looking forward to working with another 200 (give or take a few!) participants this week in Islamabad. I can’t wait to see what kind of amazing things they create!